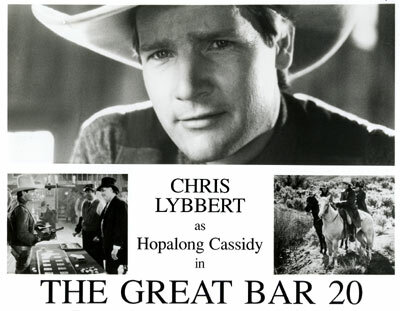 Will Hutchins remembers the making of "The Great Bar 20". Howdy! Let’s rent an ol’ barn and put on a western! Made my first oater way back in ‘55 at UCLA film school—called it “Bad Day Without White Rock”. Got a B-Minus. We have our choice of flyin’ or drivin’—shucks, if God had wanted us to fly, he’d have given us wings—before we die. What ho! for the open highway. Babs at the wheel, Hutch in charge of the tape deck. The USA’s a great place, once you get out of L.A. Ahhh! Smell that clean air! Great to be out among the Burma Shave signs. First night out we camp at a motel nestled among the Tall Pines in Mariposa, up in Mother lode country. Oh, so small and oh, so pretty. Looks not unlike a movie set. Flannel cakes for breakfast. Outside the coffeehouse, a huge sculpture, hacked out of tree trunks, of a prospector and his over-loaded mule. Move ‘em on out up Highway 49, one of the world’s prettiest drives—Mark Twain territory; jumpin’ frogs territory—a trip back into the 19th Century in Columbia, Sutter Creek, Hangtown, Nevada City, with a stop-off for Cappuccino in Sonora, home of Johnny Mack Brown’s lovely daughter. Babs drools as we roll by an army of antique shops. Then, down to where Sutter discovered gold. Babs discovered tonight’s bed and breakfast in a country living magazine. Next morning at breakfast we ask our charming hosts, “Who made all that noise upstairs last night?” They tell us it was probably the lady ghost from the big house on the hill who pays occasional visits to scout out the male clientele. At Auburn we connect with 80 East and a harrowing drive over the notorious Donner Pass in a June blizzard! What do we know about blizzards? We’re city folk—we’re scared—we think of the Donner Party. We appraise each other’s palms—tasty little devils, they say. We look soulfully into each other’s eyes. “You’re an angel,” says Babs. “I’ll always remember you.” Somehow, we make it down the mountain into Truckee, where Chaplin filmed scenes for “The Gold Rush”. Remember? He ate his shoe. Reno, Sparks, Winnemucca, Elko. Gettin’ mighty dark. We drive into a fence lookin’ for our digs at a cattle ranch in Jiggs. “Welcome!” Say warmhearted cast and crew. We hit the feathers pronto, you bet—zonked, clothed, atop the blankets. Next day out to the rodeo site located on a deep green meadow at the foot of the breathtaking snow-capped Ruby Mountains. Bud with a beard outfits me. I look like a small town judge. Bud worked for McQueen. I comment Steve always wore standout duds—Bud says Steve was a stickler. Once he gave Bud cash for 100 pair of levis. Bud had to age ‘em all down. Babs is outfitted schoolmarm style. No one in town escapes working on this epic, cowboys and townfolks alike. Clu Gulager and Adrienne Stout are the only other pros. They’re wonderful. Chris Lybbert, a champ rodeo cowboy, plays Hoppy with a limp. Ol’ Chris acts all day and honky tonks all night. Shades of Duke Wayne. Christopher Coppola takes his time and works quietly. He’s an actor whisperer. He has his uncle’s eye with the camera. Flick-makin’s like the army: hurry up and wait. Well, I wait four days. My turn. Late afternoon. Gotta change locations tomorrow. Gentle breezes billow the ladies’ dresses like sails on this sea of grass. The sun on the horizon is burnt orange. It’s the John Ford hour. “We’re laffin’ our way right into golden time,” whimpers the assistant director. You can always spot the AD’s by the ulcer operation scars on their bellies. “Action!” I ad lib, “Ladies and gentlemen! And you, too, folks- Heh, heh…” Babs gives me an encouraging smile. Magic time. “Can ya all hear me? Last week my mare dropped her foal, and I got a little hoarse!” Ol’ 20-takes Hutchins is transformed into one-take Hutchins. “Let the horse race proceed!” And so on. It’s a wrap before sundown. At dinner I’m toasted with Coppola wine. Reluctant farewells in the morning. We drive back to L.A. and our jobs, but our hearts are in the highlands…Ay dogies, that was a honeymoon and a half.